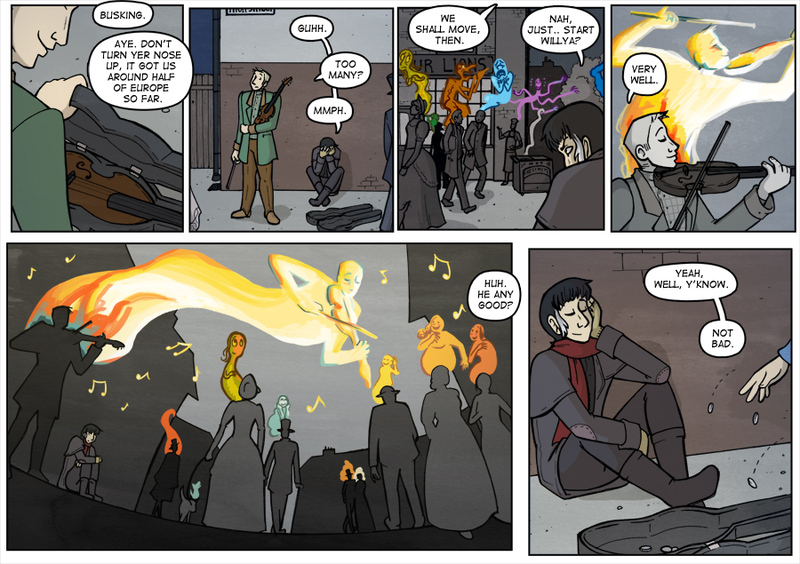 I've ventured into SFF-y music before, but today it's time to take a look at a webcomic, and one of my personal favourites at that: Widdershins, by Kate Ashwin. And as for why this isn't a review? Well, it's simply because I long ago decided that Widdershins is pretty wonderful indeed, so this'll be more in the nature of a recommendation. A very long recommendation. nd what's more, the linked tales form a larger arc. I won't be spoiling anything, but according to the author, there'll be seven in the first main plotline. The stories so far have ranged from 59 to 106 pages in length, so don't worry, there's plenty of time for development within each. In fact, the structure's always been a positive addition for me, giving plenty of aspects of Widdershins (from a run-down hotel seeking out chefs through rather... arcane means, to a company exorcising botched summons) their own space, and providing your regular dose of plotline resolution (something that can easily slip in a webcomic). - Did you not hear 'steampunk'? I kid, but Kate Ashwin's art really brings the aesthetic to life. While it's more 'Victoriana-with-a-flourish' than full blown 'airships for all' steampunk (ie. the occasional clockwork contraption), it's a wonderful look (and I doubt many could deny that a number of characters are looking very... dapper). More importantly, it's diverse steampunk - something the subgenre has often failed at in the past. Her take on magical England includes several protagonists who are PoC (including the rather awesome Alexa King), and of course, a number of wonderful female characters (I always look forward to Harry's moments. Especially those including giraffes - and further, she's allowed to exist without apology while representing a character type that's sadly normally portrayed as male-only, which I rather love). As far as LGBTQIA+ goes, it's also promising, though not to the same extent: Mal is asexual (Word of God here), Nicola - though not as yet a main character - lesbian, and there's a gay couple in Piece of Cake, the fourth story. Altogether, it's a very welcome addition, and I can only cheer it on! Sidney's introduction. It's not hopeful? - A unique magic system. I know, I know - I'm always interested in the magic. But Widdershins' sorcery involves the conjuring of spirits and emotions, and it's a rather interesting one (especially when rather nastier emotions - greed and sloth for example - get involved). Mechanical insects? Imbue them and maybe they'll fly. A bracelet for the King of Thieves? A bit of greed, and it won't leave its owner until they're dead. But unusually, it also deals with what happens, and who has to deal with it (hint: lowly council employees) when it goes wrong. 'Malforms', or more commonly 'buggerups' are botched summonings, and a major storyline involves some protagonists being enlisted to take care of them. What's more, it's apparent there's more to the system, and we seem to be learning more fragments with every story - and I'm looking forward to every word of it. - Hints at a building larger arc. 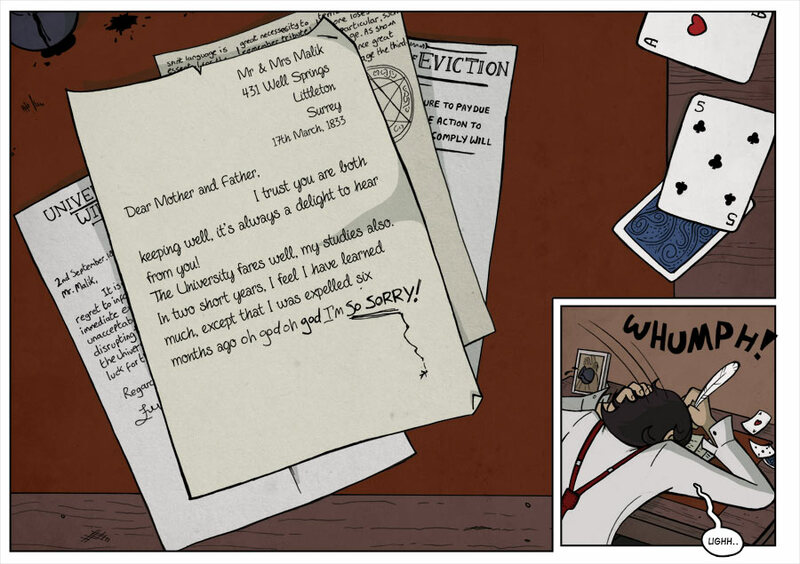 While obviously I won't spoil it, it's apparent what's going on at this point - and how the tales are starting to connect, both overtly and rather more subtly. Continuity and worldbuilding is a big draw for many (just think of how many fans like to puzzle out the tiny hints and connections in Brandon Sanderson's cosmere books, and it's no different here). - The art. It's clean, expressive, and really conveys the characters (especially Voss) - and the different styles used (for example, to convey Mal's seeing of spirits) really work well. It's not one of those that'll make you gawp in wonder on a regular basis, but it does convey some spectacular moments in... spectacular fashion. Mal's sight. I love the colours in these ones! Altogether? I'd thoroughly recommend it. 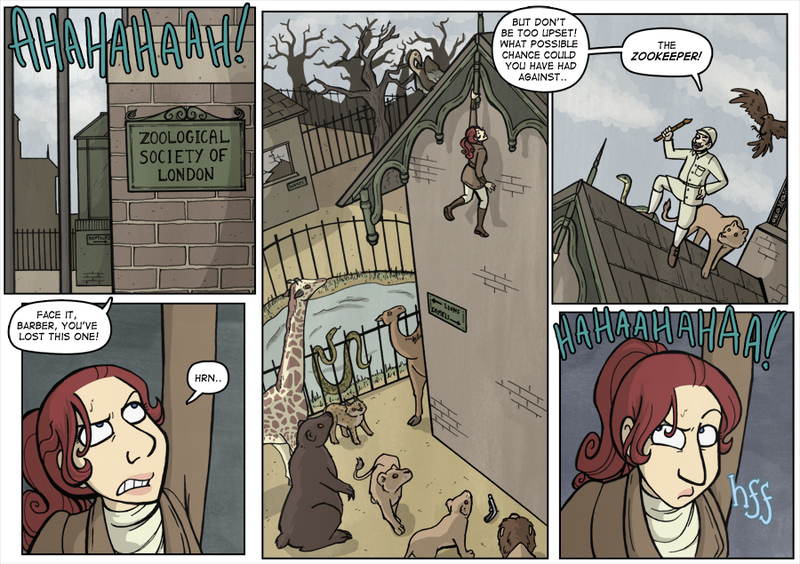 While its style of storytelling won't be for all, it's well worth a look for those seeking out a new webcomic read, and especially one in a steampunky genre. Particularly, its short story approach makes it suitable if you don't feel up to a long archive binge, or the arc fatigue that can set in with long-running plots - Widdershins deftly avoids both. It's wonderfully written, very inclusive, and represents a steampunk vision I can only look forward to seeing more of. You can find it here.